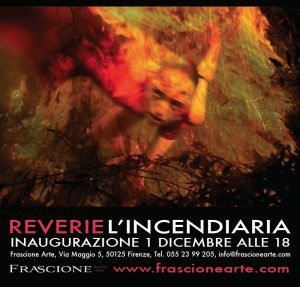 In occasion of Contemporaneamente the gallery Frascione Arte presents a show which combines the most recent expressions of contemporary art and precious old master paintings of the Frascione collection. The gallery is proud to present the young artist Reverie. The young visual artist, born in 1994, debuted under the name Reverie on May 23, 2017. Reverie, meaning to let yourself go into a realm of fantasy in Italian, is her official birth-given middle name. Over the last few years, the eclectic performer has infused Art into every moment and action of her life. With Tuscan origins, and a resident of Vinci, she lives and works in Milan. In addition to her own projects, she often collaborates with other artists because she is interested in interpreting the point of view of others through the different forms of expression. Recent public performances: “Tempo zero” (Fondazione Mudima, Milano), “Rinascimento ipersensibile” (Palazzo Strozzi, Firenze), “PourOntani” (Hotel Excelsior, Venezia Lido), “C.U.M. Confessione Unica Memoria” (Vinci, colle di Ceoli); “Futura Poesia” (Estorick Collection, London).